Lumident - Why should we treat primary teeth? Treatments / Why should we treat primary teeth? 1. They help guide proper eruption of permanent teeth. 2. They help maintain good nutrition with proper chewing. 3. They permit normal speech development. 4. They need to be repaired to avoid the pain and suffering your child can experience from an abcess, which in turn can lead to possible hospitalization. 5. 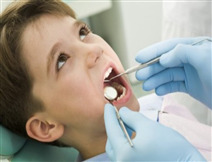 To avoid damage to the developing permanent teeth. 6. To avoid inadvertent extraction of a permanent tooth bud with early extraction of the primary tooth. 7. To avoid high bacteria count resulting from tooth decay and that can create potential lifetime problems. 8. To avoid decay of the neighboring teeth via bacteria shed into the saliva. 9. To provide shape formation of the mouth. 10. Because your child's smile affects their sense of confidence and self esteem.